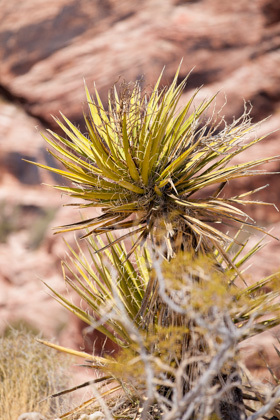 Las Vegas was never high on my list of places to check out. But because Kevin was asked to fly to Vegas for work… and there was a seat sale… and it hadn’t stopped raining in Calgary in over 2 weeks… and I had a bit of free time in my schedule… I decided to tag along. And to my surprise? I found a handful of amazing restaurants that totally blew my mind. 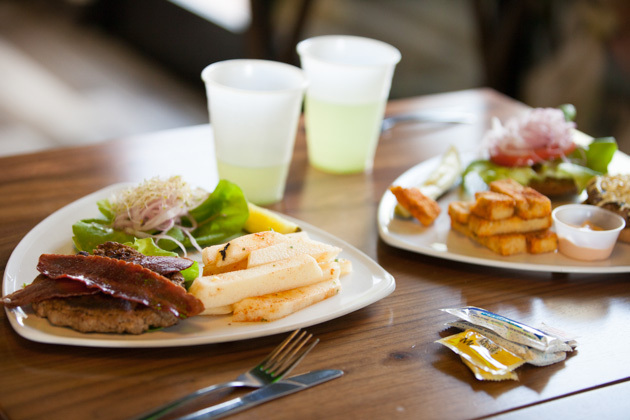 Instead of doing our regular What A Nutrition Educator Eats feature, I thought it’d be fun to share some of meals we enjoyed during our 6-day stay. 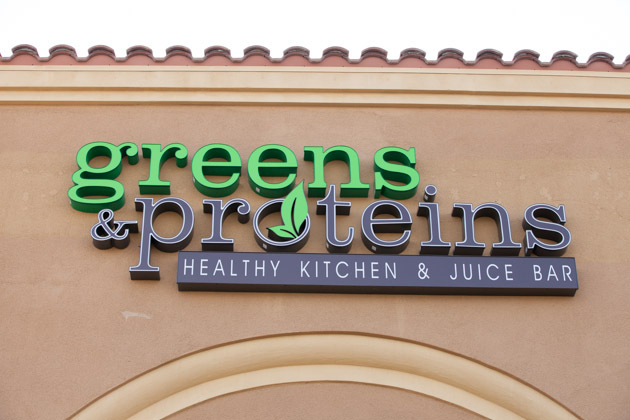 There are a couple of Greens & Proteins locations throughout the Las Vegas. 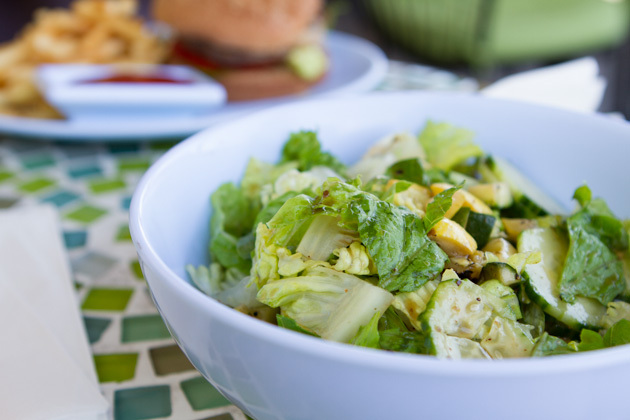 Whether you’re gluten-free, vegan, paleo, dairy-free or grain-free, these guys have options for you. I ordered a turkey burger with turkey bacon on a lettuce wrap and jicama fries. Kevin ordered a bison burger with vegan cheese on a whole wheat bun, tofu fries on the side. So good. So simple. So delicious. 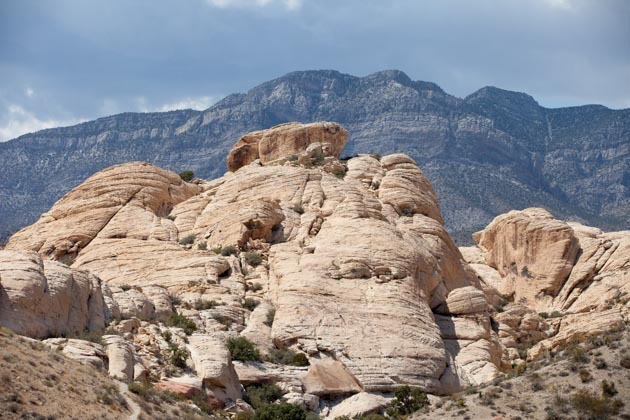 We were pretty close to Red Rock park so decided to make a stop over to see what all the hype was about. We both took a billion pictures… each. But I’ll spare you the scrolling. 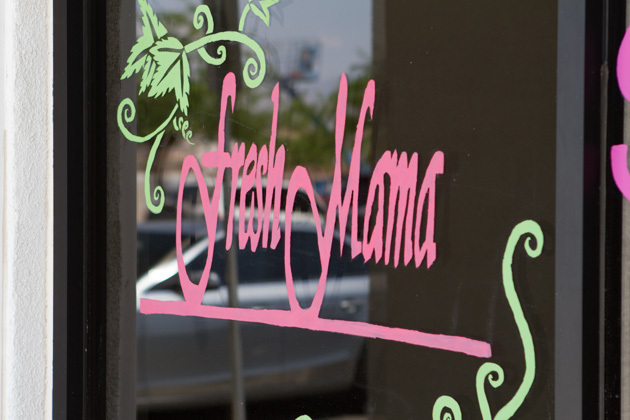 One of my all-time FAVORITE places in Las Vegas (I went 5 times in 6 days) was the freshetarian restaurant, Fresh Mama. 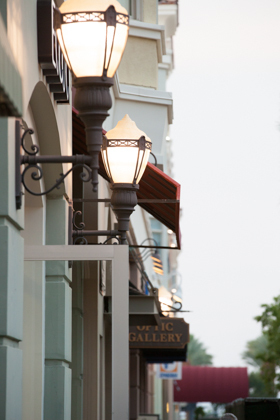 The restaurant is attached to the hot yoga studio on Rainbow Blvd, about 15 minutes away from the strip. 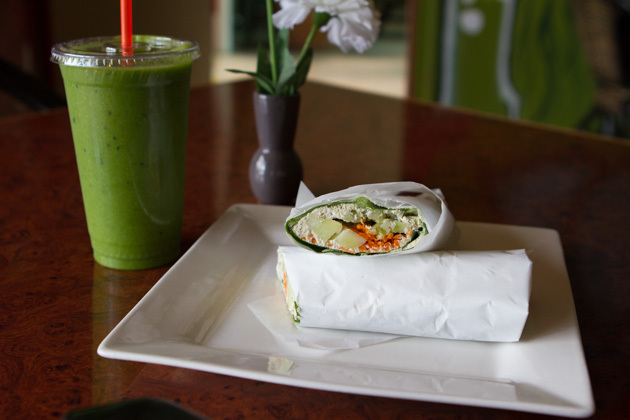 While the menu items at Fresh Mama cater to hot yogis (items are labeled as recovery, replenish, hydrate, depending on the type of class you attended) it’s also a really great place for anyone to enjoy. 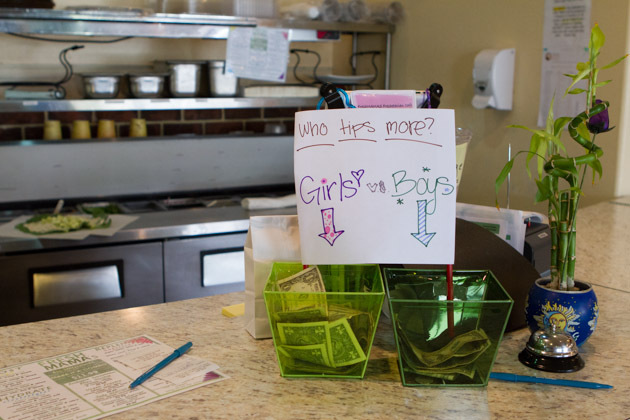 As a nutrition educator, I was completely impressed with the menu, through and through. The fact that they have connected the menu items with the types of yoga offered at the studio, was something out of a dream. I highly, highly recommend this restaurant. 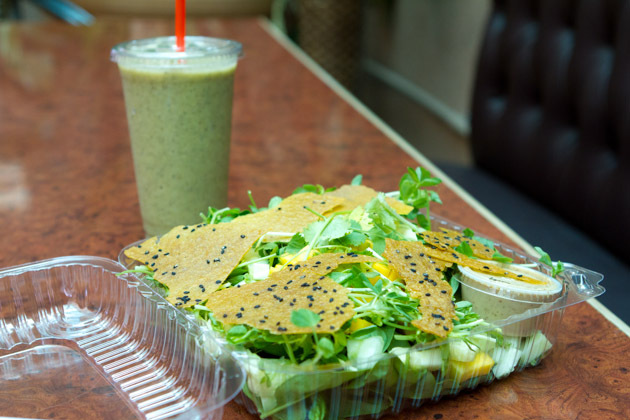 During one of my visits, I enjoyed a mango salad of spinach, mango, cucumber, jalapeno, sprouts, cilantro, ginger-­mustard dressing and topped with dehydrated coconut chips. To wash it all down, I ordered a twisted mint dragon smoothie. 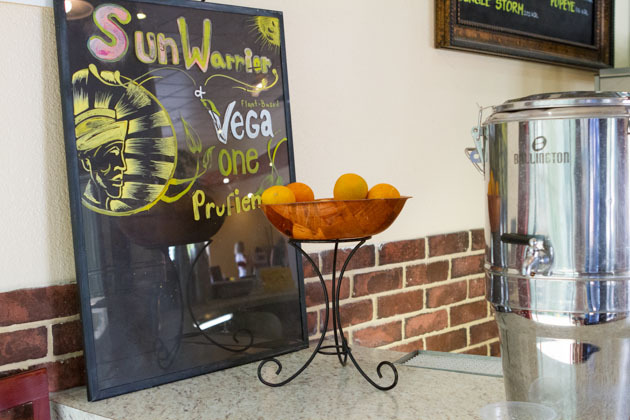 They offer Sun Warrior and Vega One protein powder boosters to all of their smoothies, a couple of them come with hemp, too. 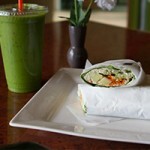 Another of my favorites was the chard wrap with macadamia nut hummus. I love the hummus so much that I recreated it the moment I got home. You can find my macadamia nut hummus recipe here. 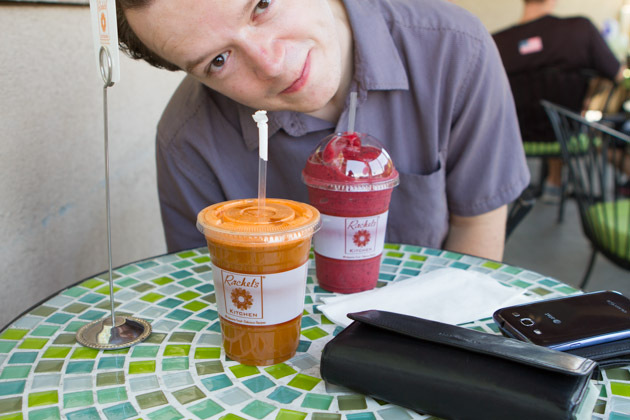 And, I treated myself to lick-lippin’ popeye smoothie. Last, but definitely not least, is Rachel’s Kitchen. 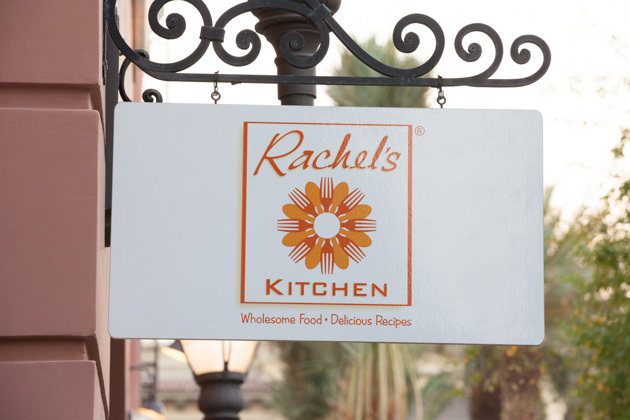 Like Greens & Proteins, Rachel’s Kitchen caters to a bunch of different eating styles and has multiple locations sprinkled around the city. The thing we loved most about Rachel’s Kitchen was that it catered to the meat-loving customer (Kevin) and the fresh juice, gluten-free, health conscious customer (me). All in one place. Before Kevin proposed(!!) we had plans to hit up Rachel’s Kitchen. 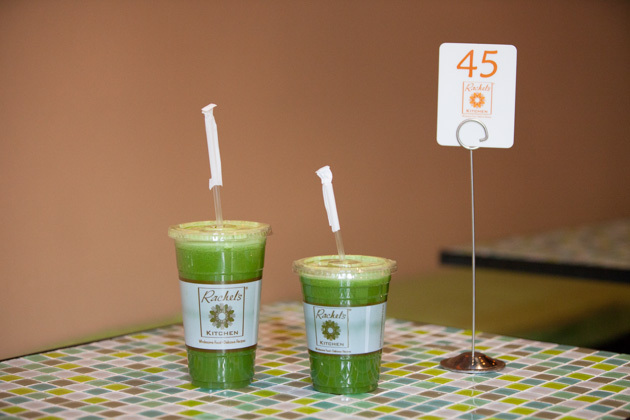 We debated going out for a fancy meal to celebrate, but decided to stay with the plan, go to the restaurant, and order a round of ultra green juices to celebrate. It was super intimate, healthy and… so us. And I opted for a grilled veggie salad. We ended hitting up Rachel’s Kitchen 3 more times during our stay. 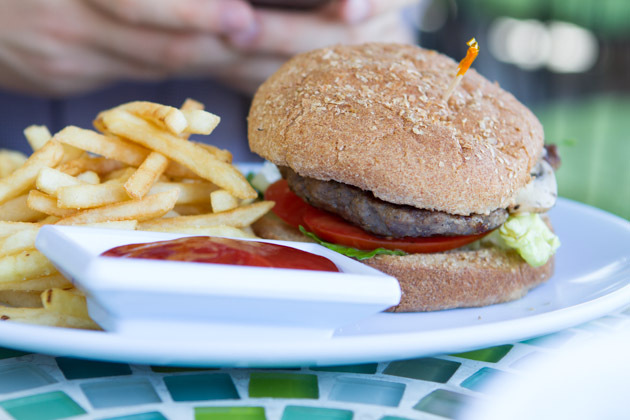 Once for dairy-free smoothies and juices, and another time for a round of burgers. 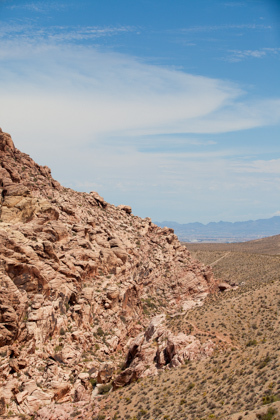 In the end, I realized that Las Vegas is SO much more than the booze, parties, gambling and unhealthy indulgences. There is quite an amazing health scene, one far more vast than I’ve seen in many other cities across North America. 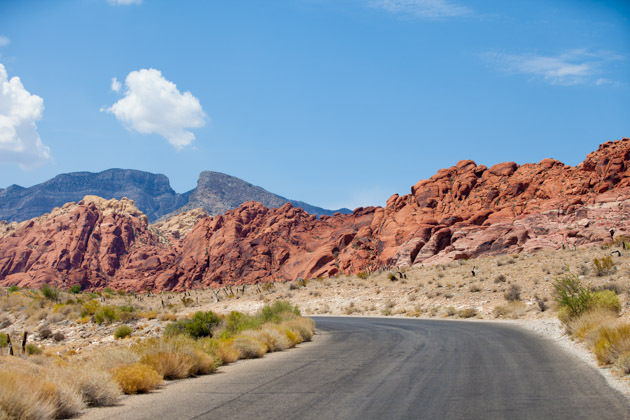 I’d love to know – have you been to Las Vegas? If so, how did you enjoy it? What was your favorite activity?